Instead of a required 15 feet setback from the property lines, the developers want a setback of 0 feet. To get the variance, the developers must answer and prove several issues, some of which are found on the application. We want to examine those issues. The developers don’t answer the question. Instead of talking about what is “peculiar” to their property, they look to comment about an adjacent property. There are often properties that aren’t straight, have cut outs, or whatever on them. It’s common. Therefore, absent of any other statement from the applicants, there is nothing “peculiar” to their property. In our opinion, right off the bat the request for a variance fails as it does not meet the legal requirement. The answer to this question seems to hinge on the idea that the owners of the yellow property did not want to sell the property to the developers or the City. They have that right. They don’t have to sell. It is ridiculous to think that a variance can be granted on the basis of someone not wanting to sell their property. Think about this for a moment. Imagine that someone wants to build on property next to yours. They make you an offer to purchase your property. You decline. Should a variance be then granted to the builder to build right on the property line? Would the builder get a variance because you would no sell? The answer is “of course not.” Yet that is exactly what is being proposed here. Because the owner of a property did not want to sell, the developers want to build on the property line(s). Secondly, for this answer, the idea that the setbacks don’t provide separation or benefits to either property owner defies the facts. Of course the setback provides separation. That’s what a setback does. As for “benefits,” it certainly is not up to the applicant to speak for the owner of the yellow property. In fact, it is almost obscene that they think they can. What is clear, however, is the the developers gets a clear benefit from the zero setback. That is why they are applying for it. It gives their building more space. Even more importantly, a variance is granted when the property is constrained by the actions of codes and regulations made by the City. It has nothing to do with adjacent properties. The idea that a variance should be granted because of another property is not within the scope of the law for variances. The benefits to the variance would be one sided and contrary to the legal requirements we have looked at so far. Same story, different telling. While the developers want to make this about the setback fro A1A, that is not the issue. The issue is the setback from one property to another. Once again, think about if your house were on west side of A1A and someone wanted to build to the west of you. Could they get a variance to build on your property line because building there “maintains the setback from A1A?” Of course not. 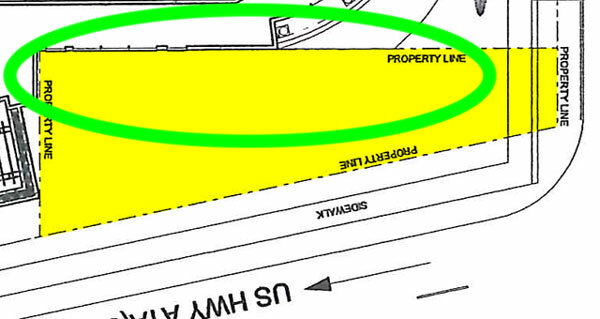 If the issue is the A1A setback, then why not maintain the setback from on the southern property line (between the blue arrows) of the yellow property? If the issue surrounds A1A, why is there no setback on that southern property line? The answer is that this is not about the setback from A1A. The variance is being requested to increase the size of the buildable area for the hotel. That’s it. That is what this is all about. The applicant themselves show that this is not about the setback from A1A. They just want more space to build upon. This is going to take a little bit of parsing of the question. The question makes the assumption that the applicant has proven that the “reasonable use of the land” is in question. Not one statement or scintilla of proof has been offered that there is no reasonable use of the land in question. Granting the variance would not take a property that is unreasonably restricted by City Codes and suddenly make it reasonably usable. It just doesn’t The land is there for reasonable use now and the developers have not shown that the setbacks impede that reasonable use. Once again, this answer is predicated on knowing the desires of the yellow property owner. Whether the variance “impacts” them is not for the applicant to postulate or suppose at all. Secondly, if the City did not want setbacks between properties in areas zoned as commercial, they could have passed that within the building codes. 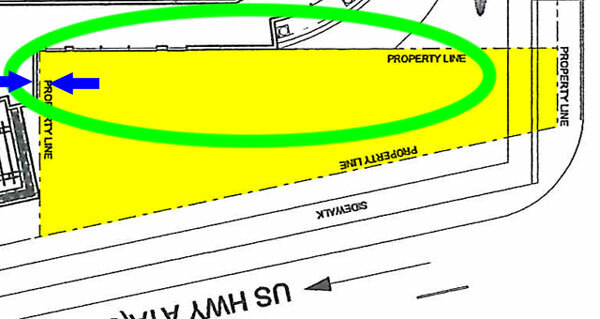 And again, if this is all about the setback from A1A, why does the applicant want to build on the southern property line of the yellow property? Frankly, the fact that they want to build up to that line demonstrates conclusively that the A1A setback is merely a convenient argument and not the actual reason for this variance request which is for more space onto which to build a hotel. There is no legal basis for the variance. The developers never make the case as to how their property is adversely affected by the setback requirements and instead attack other properties. Not being able to buy a property is not a reason for a vairance. The idea that the setback doesn’t provide separation between the two properties is laughable on its face. The developers are being less than honest when they say they the reason for the variance is the setback from A1A, but yet want to build up to the southern property line of the property they could not buy. Therefore as there is no legal basis for this variance and the variance fails at every turn, we fully expect the Board of Adjustments to grant the variance. Despite the fact that if this were a regular property in the City, this thing never would have made it past the Building Department, it will get passed. We will be shocked if it doesn’t. Welcome to life in small towns where laws and codes don’t matter to some and are subservient to the desires of a few. ADDENDUM: We have had several discussions with people who are against this variance and are planning on attending the meeting. We applaud their convictions and willingness to stand up and be heard. Issues like this are best served and decided when there is input from people. We want to make clear the potential effects of what you might say at this meeting. It is important to remember that this hearing is conducted as a “quasi-judicial hearing.” A “quasi-judicial hearing” is defined as a legal proceeding at which the triers of fact act as judge(s) in a limited capacity due to special knowledge of the issues. Board of Adjustments can hear cases like this because the members of the Board have knowledge of the area and applicable codes. It is a legal proceeding at which people are sworn in and testify under the penalty of perjury. We bring this up because if people go into hearings like this and their main argument is “we don’t like it,” there is nothing for next level court to review. “Not liking” or even “liking” a variance is not – repeat not – a reason for granting or denying a variance. We repeat: don’t argue feelings. Argue facts. Argue the laws and codes. We always suggest coordinating with other speakers if possible. Instead of trying to handle all the points we raised at once, have one person discuss one point, another another point, etc. We also recommend that you practice what you are going to say and time yourself. Three minutes goes by fast. Remember that if you are for or against this variance, you are trying to get the legal basis for your support or opposition on the record so a higher legal authority can review it. Perhaps more importantly, you are tying to convince the members of the Board of the legal strength of your position. Try to convince them of the legal issues as well. A couple of months ago we read an opinion from an Appeals Court that specifically stated that the people who objected to a variance had not raised any legal objections at the time of the hearing and therefore the court could not act on it. The Court even acknowledged that people were against the variance and acknowledged that there were legitimate legal questions raised in the appeal, but the Court couldn’t look at that because they can only review the legal issues raised at the original hearing. It is very difficult to not get fired up about things like this. However, emotions don’t sway Board members and they don’t sway appeal courts. Is such a variance then even lawful to approve? Just who really “benefits” and who “pays”? The taxpayers “pay” when the property is sold at a loss. 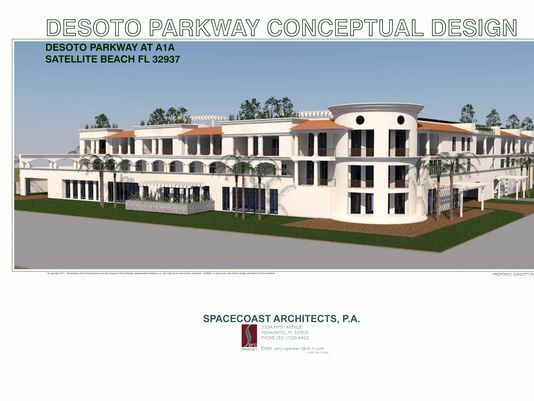 The property owners to the east with frontage along SR A1A “pay” due to the zero setback. The developers wholly “benefit”, along with city leaders who seek to fulfill their agenda, despite all the evidence that should lead them to deny the variance. The qualifications for a variance are laid out be statute and codes. This variance doesn’t appear to meet the standards for a variance. If anything, it appears to grant a variance would give special dispensation that other property owners in the zoned district and the City do not enjoy. Granting a variance on a 15 foot setback to zero feet is way outside what others have to do with their properties. The City has owned the parcel for years and neglected to ever clean up the property lines. Since this is to be a sustainable hotel, and Satellite Beach is making plans to be underwater, shouldn’t the first floor be vacant with parking for boats?